RMB 25: from Zhongshan eastern two road to Yangpu Bridge (about one hour). RMB 70-120: from Zhongshan eastern two road to Wusongkou Port (about three hour). Huangpu river is not only the mother river of shanghai but also an icon and epitome of Shanghai. On both sides, there is a collection of the best city landscape of Shanghai, which reflects the past and present of shanghai, from which one can look into the future of Shanghai as well. Nowadays the Huangpu River becomes a world famous tour bay. This River is a golden gateway of foreign trade as well as an important waterway to the pacific ocean from the Pudong new district. 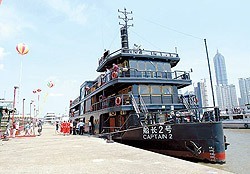 cruising on the Huangpu River is an important traditional travel program in Shanghai. riding a cruise boat along the Huangpu River, you will take a glimpse of yangpu bridge, Nanpu bridge and Shanghai oriental pearl tv tower on both sides. various exotic architectural buildings on the west bank of Huangpu river stand opposite to various modern skyscrapers on the east bank. Wusongkou port, a convergent point where the Huangpu river joins the Yangtze river, is adjacent to the eastern sea. therefore, it is a place where three streams combine. Tips: the best time for a cruise on the Huangpu river is in the evening when numerous neon lights connect with the reflection of flicking stars in the Huangpu river. If travel when the tide is rising, one can see the spectacle that three streams combine.